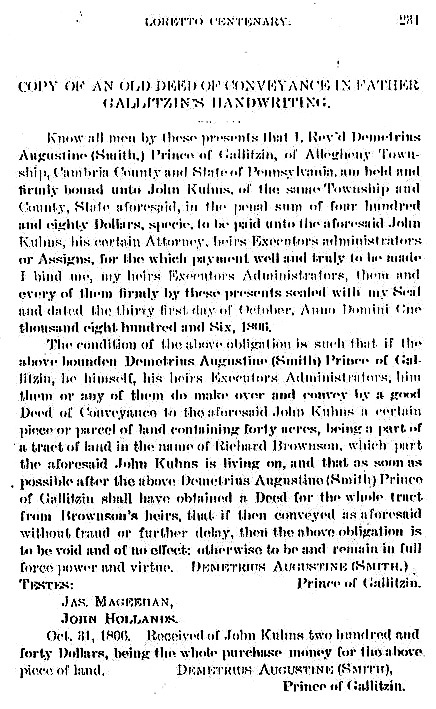 Know all men by these presents that I, Rev'd Demetrius Augustine ( Smith,) Prince of Gallitzin, of Allegheny Township, Cambria County and State of Pennsylvania, am held and firmly bound unto John Kuhns, of the same Township, and County, State aforesaid, in the penal sum of four hundred and eighty Dollars, specie, to be paid unto aforesaid John Kuhns, his certain Attorney, heirs Executors administrators or Assigns, for the which payment well and truly to be made I bind me, my heirs Executors Administrators, them and every of them firmly by these presents sealed with my Seal and dated the thirty first day of October, Anno Domini One thousand eight hundred and Six, 1806. The condition of the above obligation is such that if the above bounden Demetrius Augustine (Smith) Prince of Gallitzin, he himself, his heirs Exxecutors Administrators, him them or any of them do make over and convey by a good Deed of Conveyance to the aforesaid John Kuhns a certain piece or parcel of land containing forty acres, being a part of a tract of land in the name of Richard Brownson, which part the aforesaid John Kuhns is living on, and that as soon as possible after the above Demetrius Augustine (Smith) Prince of Gallitzin shall have obtained a Deed for the whole tract from Brownson's heirs, that if then conveyed as aforesaid without fraud or further delay, then the above obligation is to be void and of no effect; otherwise to be and remain in full force power and virtue. Oct. 31 1806. Received of John Kuhns two hundred and forty Dollars, being the whole purchase money for the above piece of land.